The Los Angeles Times is reporting that President Barack Obama told the Rev. Al Sharpton that he called on a higher power to help him understand the congressional super committee's failure to reach a deal to cut $1.2 trillion from the federal budget. 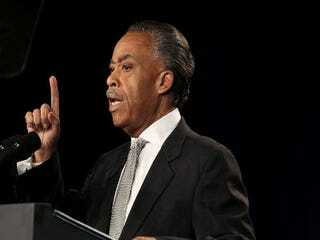 He made the statement on Monday during Sharpton's radio show, Keepin' It Real With Al Sharpton. He reportedly said he was disappointed but still hopeful that legislators could reach an agreement. “It must be my religious faith, reverend, because hope springs eternal … and I continue to believe that at some point, common sense will prevail and we’ll be able to work something out,” Obama said. “There’s no doubt that I’m disappointed that not just Congress generally but the Republicans in particular are not willing to put serious revenue on the table as part of a balanced plan,” Obama said. It is clear that the congressional super committee could have benefited from President Obama's leadership, but his hands-off approach helped expose the do-nothing Congress. The next time congressional leaders try to blame the flailing economy on the president, they should just look in the mirror.